The Public Market in Taysan, Batangas. Image source: Google Earth Street View. 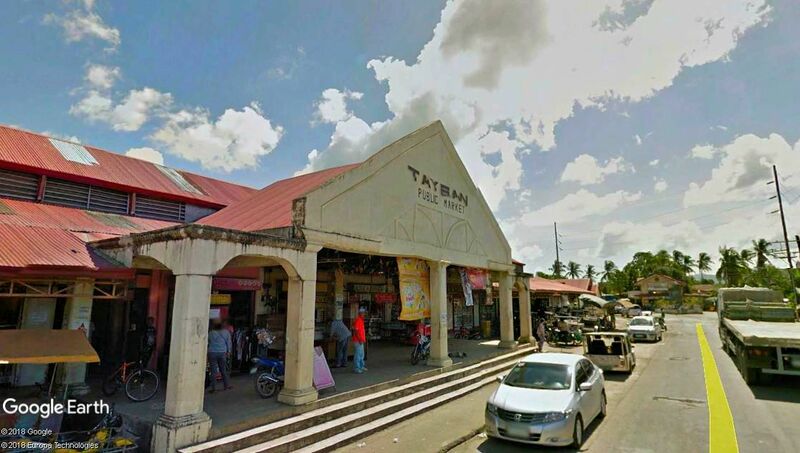 Continuing with this web site’s series on late 19th century Batangas as described by the former government official and historian Manuel Sastron, we switch to the Municipality of Taysan to the southeast of the province. The descriptions of the town in this article are from Sastron’s book “Batangas y Su Provincia1,” published in Malabon in 1895. Sastron began by describing Taysan’s physical characteristics: that it was just 14 kilometers from the “cabecera” or provincial capital (the actual distance is actually less than 14 kilometers as the crow flies; but late 19th century travel to and from Taysan must have been particularly torturous in this era); and that it was bounded to the north by Rosario, to the south by Lobo and to the east and west by Ibaan and San Juan de Bocboc. There were five roads with which Taysan communicated with the rest of the province, wrote Sastron. One went to the town of Batangas, the capital; another to Lobo; and the rest to Rosario and adjoining localities. According to Sastron, Taysan’s population in the late 19th century was 7,074 “souls.” Contrast this to the town’s population as per the 2015 Philippine Census of 38,007. Life in the town was austere, even more so, observed Sastron, than the nearby town of Rosario. Parts of several rivers ran through the town, according to Sastron: the Calbangan, Lucban, Bilugo, Qui-iyama, Calumpit, Chile and the Mabago. Most of these rivers flowed from east to west. All in all, there was a lot of water in the town, but ironically, all of its 3,000 hectares of cultivated lands were not irrigated and, therefore, dependent on rain. Taysan’s main agricultural produce were “palay” (rice), mongo and corn; albeit there were also small plantations of tobacco, cacao and betel. Only the cultivation of rice, however, was profitable, which was probably Sastron’s way of saying that the planting of the other crops was really for family consumption. There were roughly 350 heads of cattle in the town, mostly acquired from Camarines and Tayabas (presently Province of Quezon). There were also 240 registered horses, but these were mostly beasts of burden not considered of high value. There were many mountainous areas in Taysan, wrote Sastron; mostly belonging to the state (meaning the colonial government) although, of course, there were also lands that were privately owned. Most of these wooded uplands were “hardly exploited,” as Sastron put it, which was a pity because in the woodlands there were excellent species such as the molave, banaba, dongon2 and many others. It was likely because of the difficulty of “extracting the trees,” or so Sastron speculated, that the woodlands were not exploited for commercial use. Sastron was probably referring to Taysan’s relative isolation due to the absence of good roads to and from the town in that era. The parish house or “convento,” meanwhile, was built by the Reverend Father Gregorio Paredes, who was a skilled orator in Tagalog. He also built the town’s cemetery, which had a stone fence and was located more than a kilometer from the town’s last house. This was “perfect” according to Sastron for sanitary reasons. Satron noted that there were no schools in the town other than that for children, but that the one there was very properly managed by Don Melecio Ona, who possessed a special talent for teaching. There was, however, a pending resolution to set up a school for young girls in Taysan. The town was very healthy despite the absence of “optional assistance.” What Sastron probably meant was that there were no medical facilities in the town. Criminality was also rare in Taysan, where a single religious festival was celebrated dedicated to the town patron, the Our Lady of Mercy, on 24 September. Market day used to be held on Sundays, but this has stopped because there were not enough sellers to make the event worth continuing. Whatever coffee was produced in the town was sold directly to the merchants of San Jose. Taysan also produced superior lime in a place called Monte Mapolo, which was well-appreciated in the entire province of Batangas. 1 “Filipinas: Pequeños Estudiosy Batangas y Su Provincia,” published 1895 by Manuel Sastron. 2 Sastron probably meant the “dungon-late” tree. Online at Philippine Medicinal Plants.